The new Aratuna Normanby Bridge was opened to traffic on Tuesday 15 July 2008. Eleven months in the building, it cost $1.5million. The old Normanby Bridge , built in 1877, was showing signs of deterioration to such an extent that a 3,500 kilogram weight limit and a 30km speed limit had been imposed. The structure and foundations also had very little seismic capacity. It was removed in September 2007 and work began on the new bridge, which was officially re-opened on 5 June 2008 to coincide with World Environment Day. Local iwi have agreed that the name Aratuna is a fitting one for the new bridge, as it means "pathway of eels ". This ties in with the historic importance to Maori of this area as a treasured source of food, which is also reflected in the art that now adorns the bridge. The Maitai River, and the Eel Pond that now sits in the Queens Gardens, were traditional fishing grounds for Nelson's first residents. The bridge features a vehicle lane, cycle lane and footpath in each direction. The pathway under the bridge was improved by widening and new lights. 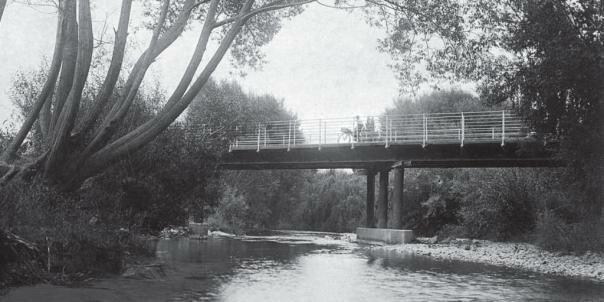 Normanby Bridge, some time between 1910 - 1920. Nelson Provincial Museum, Print Collection, 308027. 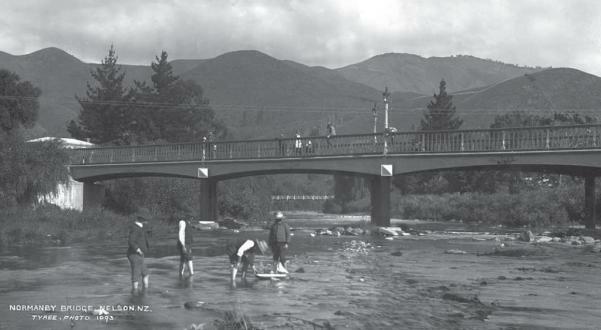 In the 1840s a footbridge linked the two parts of the small settlement of Nelson separated by the Maitai River. When it was replaced by a ‘cart' bridge in 1877 it was greeted with enthusiasm by the settlement. A City Council meeting, reported in The Colonist in June 1877, reveals that the bridge had been gifted by the Provincial Council, yet the approaches were not formed and the funds had run out. A claim was made to the government for more money on the basis that, without the approaches, the bridge "would stand a monument of folly".... "Money should certainly be found to complete all works, and the Government ought not to commence their reign by a piece of paltry cheeseparing, for economy it cannot be called." It is believed that Lord Normanby (New Zealand Governor General 1875-1879) resolved the "matter of funds" and hence the bridge was named after him. It must have had good piles, as subsequent rebuilds over the years reused them, for example when major repairs were carried out in 1906-1907 after it was discovered the stringers were decayed. 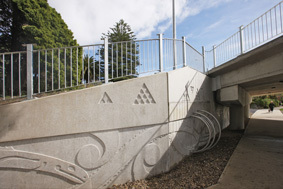 The new bridge is adorned with work by two Nelson artists, Brian Flintoff and Grant Palliser. Artwork on the Aratuna Bridge. Nelson City Council. The Maitai River, originally known as the Mahitahi, has long been significant to Mäori. For the many tribes who journeyed through the area, over a period of some 800 years, the Maitai has been a river for food gathering and a ‘highway' to access the hinterland; it is considered sacred as a provider of mahinga kai. 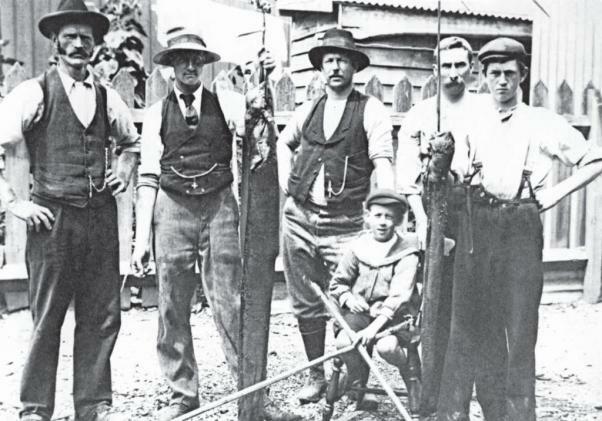 Eels, an important food source for Maori, were plentiful in the area of the bridge when it was only swampy marsh and the area is rich in historical significance to both Maori and European settlers. The nearby Queens Gardens was once a traditional roto tuna (eeling ground). The ground was an ox-bow lake, formed when a bend in the Maitai River was cut off from the main flow. The eel designs on the bridge are intended to raise awareness of Maori customs and history around eel harvesting. The cast concrete artwork under the bridge is a contemporary version of a traditional Mäori köwhaiwhai design, which depicts eels swimming between the banks of the river. The stylised artwork depicts the eels swimming into a woven hïnaki (traditional Mäori eel pot), with some emerging to live another day. The bridge artwork also reflects the hills and mountains through which the Maitai River flows, with the mountain Maungatapu, or Moketapu as it was once known, at its headwaters. From the pakohe-rich (argillite-rich) mountains flow a network of streams which gather water for city supply and to feed the lower Maitai River. Pakohe was another treasured resource, used to make stone implements which were carried down the river and traded throughout New Zealand. Mäori know eels as tuna. Tuna is a taonga , honoured for its mythological origins, highly prized as a food, and respected as an indicator of the health of our waterways. There are two main species of tuna in New Zealand, both occur within the Maitai River. The longfin eel is endemic (found only in New Zealand), while the shortfin eel is found also in parts of Australia and the Pacific. The long finned eel, which grow much larger than shortfin and are more common upstream, are a threatened fish due to pollution and commercial fishing. They have been in existence for 65 million years and are the largest freshwater eel in the world. They are found in New Zealand rivers and lakes and they grow from one millimetre to two metres, living for about 60 years. The long finned eel breeds only once and swims 5000km to do so near Tonga. The tiny larvae float back on currents and enter rivers again in July and November each year. Eel stocks in the river today are a fraction of what they were when Europeans arrived in the 1840s. Traditionally for Maori, February was the beginning of the whakaheke (migration) of tuna back to the sea. From then through to April tuna would be caught in large numbers. Hïnake (eel trap) were woven from vine and were of different design for different conditions, for example, clear-flowing water, muddy conditions, river or lake. The hïnake shown below is a typical river trap, with a lead-net attached. Once caught, tuna were kept fresh in a corfu (storage pot), shown at right, which was placed at the edge of the river. The catch was later cooked for immediate eating, or boned, dried and stored. There was a large trade in päwhera tuna (preserved eel). The new handrails feature the lyrics of two songs celebrating the waterway which is such a feature of our city, one on the north rail and the other on the south. Composed by Brian Flintoff, the songs celebrate the Maitai River and the eels (tuna) living in it. They are immortalised on the stainless steel rails in English, Maori and Braille engravings. Brian says there is no melody, the words can be sung or spoken to the tune of the river, whether in gentle babble, serene silence or angry flood. The brushed stainless steel rails were designed by Brian and fellow artist Grant Palliser, the metal supplied and folded by Steel and Tube, engraved by Wai-iti Engineering and installed by Winson Sheetmetal. The eel theme is repeated on the bridge abutments with the fish recreated in the concrete. Was hewn into parts, and slain. Grew rata vines, eel species too. Swiftly, they swam far away. In river, and eel ponds nearby. Live in this river, right here. Ever, my most treasured food." shooting bokakers with a popgun." Its song once again my respite. "As snowflakes, I blessed Maungatapu. As raindrops, old quarries I splashed. As dew, I moistened the kowhai. As mist, hid the adze making sites. In gloom I passed eels in their burrows. By dawn I heard birds all around. To join with the sea once again." But first I'll just listen again.